FOOD is both a way of life and an elevated art form in San Sebastian. 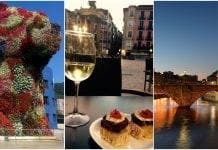 From its glittering firmament of 16 Michelin stars to its painstakingly created pintxos, Donostia, as it is known in Basque, is a city in thrall to food. At the vanguard of this culinary movement march the legendary gastronomic societies. 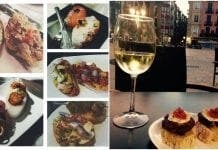 Members-only clubs, the txokos of the Basque country have been nurturing some of Spain’s finest cooking talent since 1870 and continue to draw locals (traditionally only men) together to cook for each other. 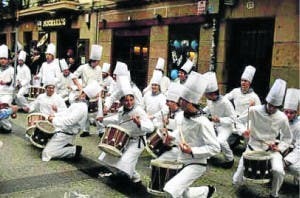 Every January, the huddled streets of the Parte Vieja surge with thousands of chefs hammering out an earsplitting beat on drums as the txokos lead the celebrations of San Sebastian’s feast day. La Tamborrada’s roots are religious, with regional pride at the fore, but the fiesta’s army of marching chefs symbolises perfectly the military precision Donostiarras adopt in the kitchen. 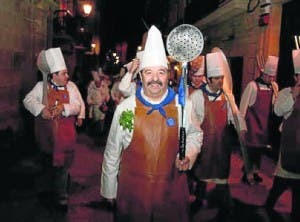 San Sebastian’s most famous society is the Gaztelubide, and every year its members lead La Tamborrada. Jose Ramon Mendizabal, known as Mendi, is this year’s Tambor Mayor (or Drum Major, a military term used to describe the man chosen to lead the cooks of the Gaztelubide). He welcomes us inside the Gaztelubide, which nestles between La Concha’s golden crescent and the basilica of Santa Maria del Coro. A smattering of members sit playing cards. Looking down on them, a photograph shows the original founders from 1934 sitting down to dinner. Mendi has been a member since 1993, a status he only achieved when his father died, after which, according to society rules, a son on the waiting list can automatically take his father’s place. “My son will then go on to take my place,” Mendi explains. The following night they will raise the flag of the city in front of thousands at Plaza de la Constitución. Pride swells in his voice. La Tamborrada is, he says, “the most important and the most emotional fiesta. The Gaztelubide’s 250 members include Martin Berasategui (three Michelin stars), Andoni Luis Aduriz (two stars) and Luis Irizar, the patriarch of modern Basque cuisine. It’s a staggering roll call of talent, but inside its kitchen the great and good of world cuisine rub shoulders easily with the man in the street. The txokos have, however, traditionally been the preserve of the Basque male, and some of the older txokos still prohibit women from becoming members. 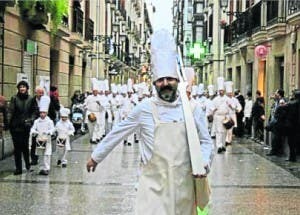 Given the expertise of men in the kitchen, I ask if Basque children normally learn to cook from their their fathers. As for the influence of chefs such as Arzak or Berasategui, pioneering proponents of the Basque nueva cocina style of cooking, Mendi is more circumspect. Riojas, including a Reserva 2001 chosen to commemorate last year’s 75th anniversary. As there are more members than places at the table, Mendi acknowledges “there will be a bit of a fight to get in”. The absence of one fond friend will be particularly mourned. The beloved Basque dish of angulas, traditionally served on the feast of San Sebastian, has almost vanished from societies menus and only one, Euskal Billera, has included them this year. The prohibitively high cost of these delicious small eels (€800 for a kilo at the local fishmongers) has seen a gradual decline in their use. Mendi says they thought about including angulas on the menu, but opted for the kokotxas instead. A cheaper alternative, gulas, is available, but the exactingly high standards of the cooking in these societies prohibit the use of inferior substitutes. The quest for culinary excellence permeates every stratum of society here, and the popularity of the txokos continues to swell this devotion. Rafael Aguirre, a local historian and expert on Basque culture who has written a book on the txokos, reveals that the societies’ are thriving. Cost is one reason that, especially during a recession, the societies are a popular way of keeping entertaining expenses to a minimum. “On a special event, maybe the birthday of your son, you join together, maybe 20 people,” says Rafael. “In a gastronomic club you prepare your own meal and you pay maybe €10 per head. If you go to a restaurant you pay maybe three times as much,” he explains. The teeming rain drenching the thousands crammed in to Plaza de la Constitución the following night seems only to ignite their passion when the Gaztelubide’s cooks ascend the stage. As the chimes of the plaza clock signal midnight, the crowd, many wearing chefs’ hats and carrying small barrels, accompany those drumming on stage as the strains of Raimundo Sarriegui’s ‘La Marcha de San Sebastián’ reverberate around the square. From the raised podium, Mendi conducts proceedings as undiluted local pride raises the decibel level of the crowd’s singing. For the next 24 hours San Sebastián marches to the beat of its own drum in a city where the heroes wear a uniform of pristine white. This article won the Santa Cruz prize for the best contribution to La Revista, a magazine run by the Anglo-Spanish society.